My P.E.O Chapter met tonight at Linderhof. The "theme" of the meeting was "All Things Downton". And when you think of Downton, you think of tea! The table in the dining room all set for tea. Because we had to sit with our plates and cups, I chose to use dinner plates. You can put your food and your cup so you don't have to balance! Real cloth napkins as well. 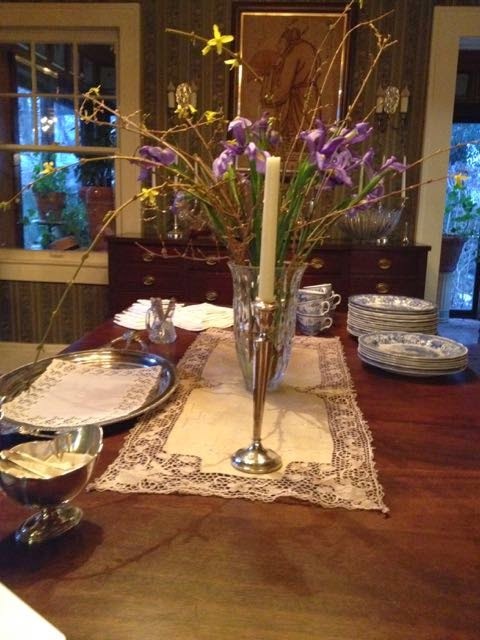 And the centerpiece is the arrangement of forsythia branches and iris. 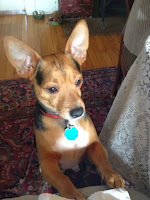 My co-hostess and I decided on sandwiches, cake and scones. The three elements of tea. 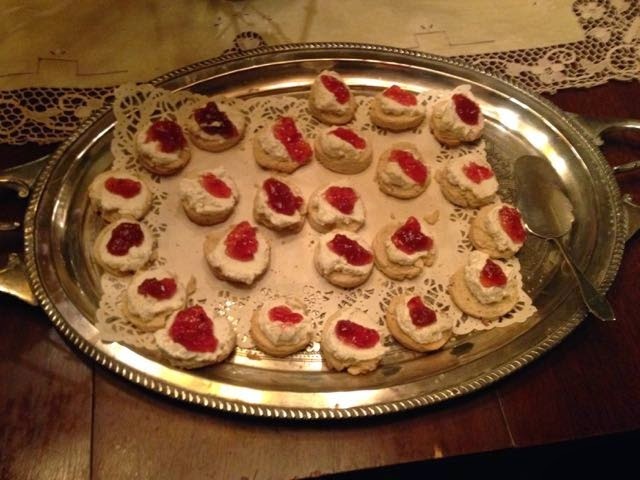 The scones were served with cream and jam and prepared the way we were served scones at a fundraiser when we lived in England. The scones were cut in half and spread with cream and topped with jam. It's less messy and can be picked up and eaten without knife or spoon! One of the co-hostesses brought the cakes. Decorated with a sunflower for we are in Kansas! 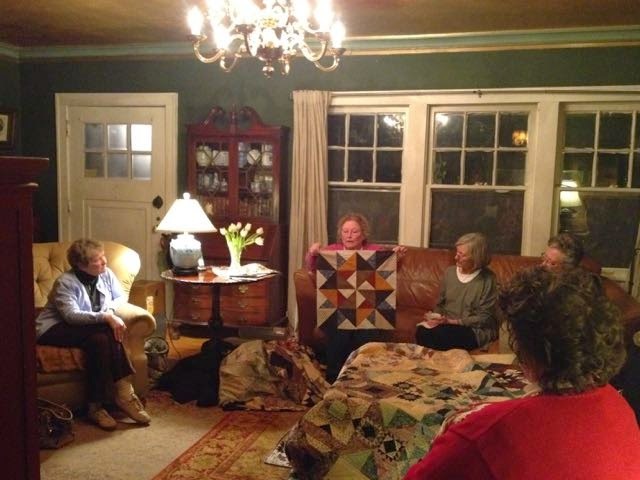 Continuing our "All Things Downton" evening, the program was about Downton Abbey quilts. Friend and member Nancy (who is a prolific quilter) gave the program on the Downton Abbey quilts that she has done last year and this. A quilt, a quilt top and quilt blocks were shown by Nancy. This is a half size Downton Abbey quilt using all four patterns from last year. 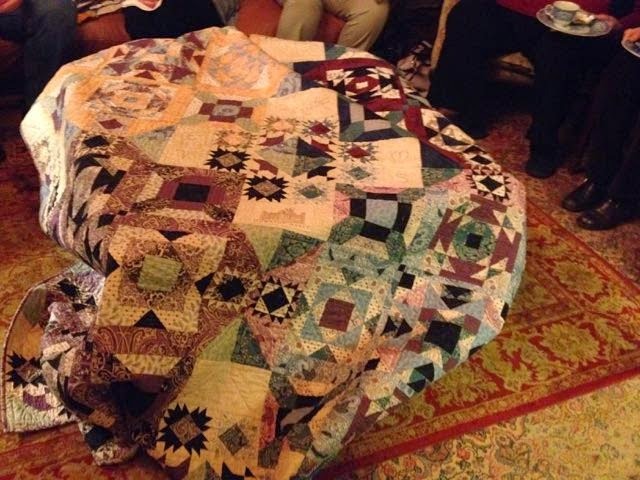 It's an unusual quilt and has been "on the road" having been exhibited nationally. 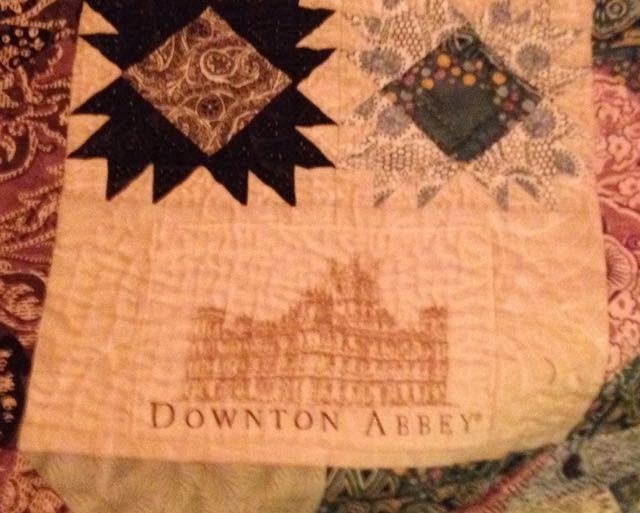 And just to prove it's a Downton Abbey quilt, Nancy added this to her quilt! 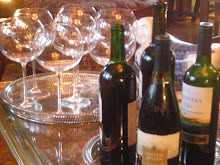 It was a fun evening as snow and sleet fell outside, we were warm and comfortable inside. With tea goodies to nibble on and cups and cups of hot tea to warm us, it was a fun evening. I feel lucky to have these remarkable women as my sisters! 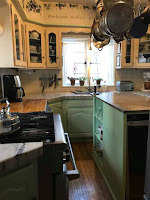 It's Thursday and I'm sharing our "All Things Downton" with Susan at Between Naps On the Porch for Tablescape Thursday. This was such a fun event for you all. Loved it! Beautiful table for celebrating tea in your home! Your centerpiece of the spray of gorgeous flowers has a feeling of spring. I'm so glad you and your cohost could bring a feeling of England to this tea table. You had a great idea of having hot tea on a cold and snowy evening. Oh I have celebrated the winter with a tea table of snowflakes china. 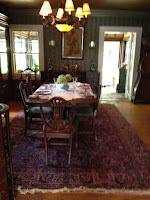 Hope you can pop over and view my tablescape. This flower arrangement is glorious! And equilter.com still has those Downton Abbey fabrics! What fun! 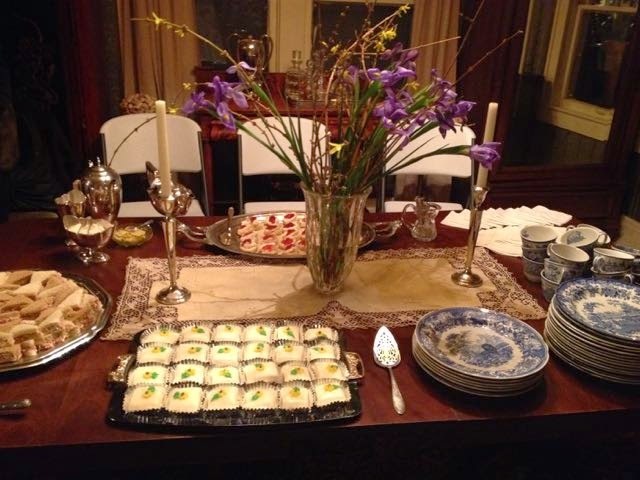 What a great idea to have a Downton Abbey party! 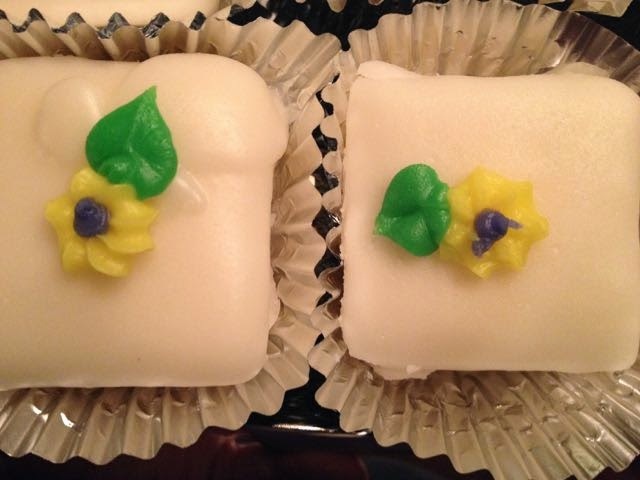 Love the looks of the cakes with the sunflowers on them, and the little sandwiches and scones. And your friend's quilts are beautiful. I'd love to hear more about the significance of the various colors and patterns. Must have been a fascinating evening. Thanks for sharing. You and your friends have such good ideas for fun times! I love the idea of this sort of evening. Fun times! Love this idea. What a great idea and it all looks wonderful! goodies, I have always loved petit fours, they are just so cute. Looks like a real fun time.